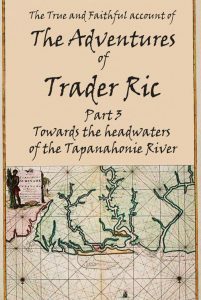 The third volume in the non-fiction series of The Adventures of Trader Ric, this account relates his experiences and encounters as he travels by dugout canoe deep into the interior of Suriname, up to the headwaters of the Tapanahonie River. His mission on this expedition is to find, acquire, and bring back safely as much Tembe Sani he could get his hands on. Helped along the way by Herve (an Ex-French Legionnaire gone native), Jean Tout (a semi-retired, SLA Ndjuka freedom fighter), along with Piku and Babu (the young cook and his pet howler monkey), Ric intertwines the narrative of the expedition with the history of the Maroon Societies (or Bosch Neggers) who still rule the region. The long trip upriver is punctuated by various obstacles: Lt. Col. Dési Bouterse’s renegade troops bent on extracting revenge on the Ndjukas, vampire bats, bullet ants, waterfalls, and a saliva-slathered fight with a guy who would soon be dead from rabies. All these hurdles and more have to be overcome before Ric reaches the Land of the Ndjuka, where his ethnographic treasures lie.